This exciting poster is designed to promote the sport of Gymnastics everywhere in the world. Every gym, every gymnast, every child should have this poster hanging on their wall! and the athlete is Julius Neuber (Austria). and reaching for the vault, momentarily flying through in the air into a flip before landing on his feet. 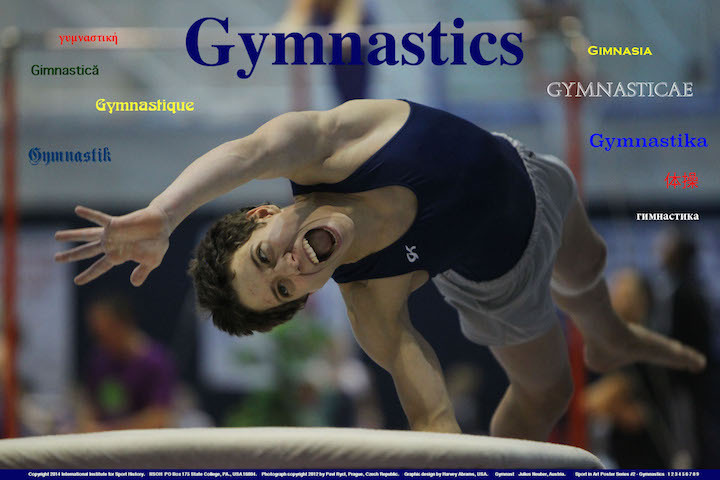 The text is the word "GYMNASTICS" in English and nine other languages. postpaid shipped in a tube - within the USA. postpaid - shipped in a tube - within the USA. $4.00 per poster, free shipping. Sell or give away to your team. postpaid - shipped in a tube - worldwide. $4.00 per poster and our postage cost is $35.00 or more. shipped free within the USA. International shipping at cost via your choice of carrier. Sell them at your events and make a profit. Download our colorful tri-fold brochure here. Print it on on one page, back to back, then you have our colorful tri-fold brochure. If you would like us to mail copies, just send an email request. Here is a complete description and wholesale price list. made out to "IISOH Library & Museum"
Sport in Art and the Olympic Games. Donor Acknowledgement - A Public "thank you"
Copyright © 2016, 2017 Harvey Abrams. All rights reserved. No part of this text on any of these pages may be reproduced or transmitted in any form or by any means, electronic or mechanical, including photocopying, recording, or by any information storage or retrieval system, without the expressed written permission of the author. Or the wrath of Zeus will be upon you. There were 26,212 visitors to my web pages to December 10, 2002 when my ISP went out of business. We estimate 28,962 hits to May 28, 2003. This new counter went up May 28, 2003. Flag Counter was added on July 15, 2012.